Traditional Cookers of Yorkshire Ltd first started in 1984 when Martin Burgoyne left another well established Aga firm to expand on his experience, knowledge and skills of fitting and servicing Aga cookers. Trading for over 30 years, we are a well established company who are experts in reconditioning, refurbishing, converting, repairing and servicing Aga Cookers since the start of our company in 1984 and are proud of our finished products. We have an excellent reputation for dealing fairly and competently. Traditional Cookers of Yorkshire Ltd consists of myself Martin Burgoyne and my secretary Kerry Watson. My love of Agas started when I was very young and would come down stairs on a winters morning and sit in front of the lovely warm Aga...apart from cooking they are great for warming your slippers! Our aim is to supply you with the Reconditioned or Pre-loved AGA cooker of your choice, with minimum complication and without compromising on quality or value. During this current economic climate, we understand how important it is to get value for money at the best price possible. Our prices are very competitive compared with other website companies and we will offer a genuine like-for-like quotation if you see something cheaper elsewhere. For example; when you are researching your Aga purchase, things to consider are....Does the total price include VAT, delivery and fitting charges? Does the cooker have a new burner? Has it been re-enamelled?.....to name but a few! A problem I often come across when I am requested to fit an Aga that has been offered on the internet cheaply, is that it very rarely ends up being a cheap deal at all! The seller just wants to sell at any cost, leaving the purchaser to rectify all the problems. The Aga may have been sold due to a fault, parts may be broken or missing, some replacement parts are now obsolete...the list is endless! Why we differ from the 'others'. 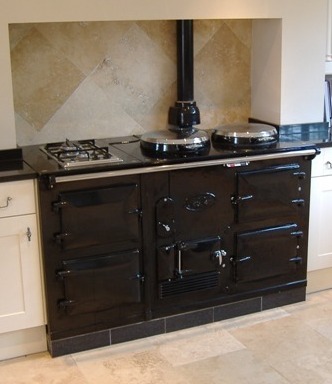 We have numerous AGA cookers in stock, some of which are on display in our showroom for you to view. All of our AGA cookers are fitted by a qualified engineer, Martin Burgoyne, and then registered with the appropriate bodies providing you with the correct certification to meet current building regulations. We are Gas Safe and Oftec Oil registered. On ordering, a deposit may be taken. Unlike other reconditioned Aga dealers, if we fit the cooker, the remaining balance will only be taken on the installation date and not before - guaranteeing our work and your peace of mind. If you arrange your own fitting, the remaining balance of the cooker is required on delivery.